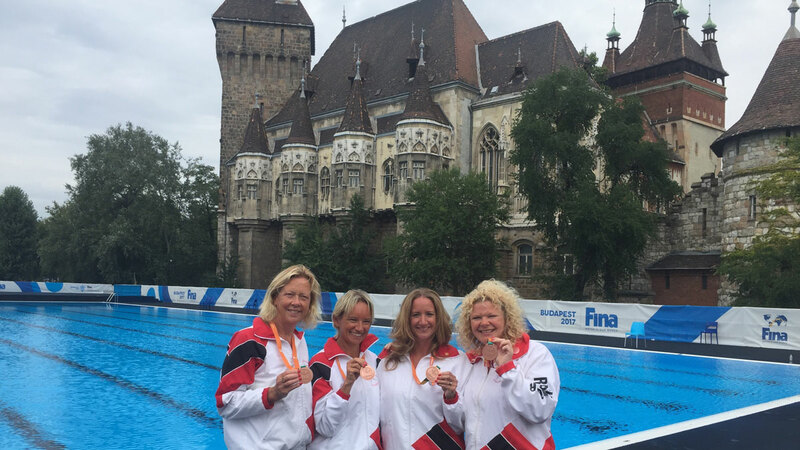 In August, Rushmoor Synchronised Swimming Club sent nine swimmers to the Masters World Championships in Budapest. Team manager and competitor Emma Adams gives us an account of the team’s performance in this blog. 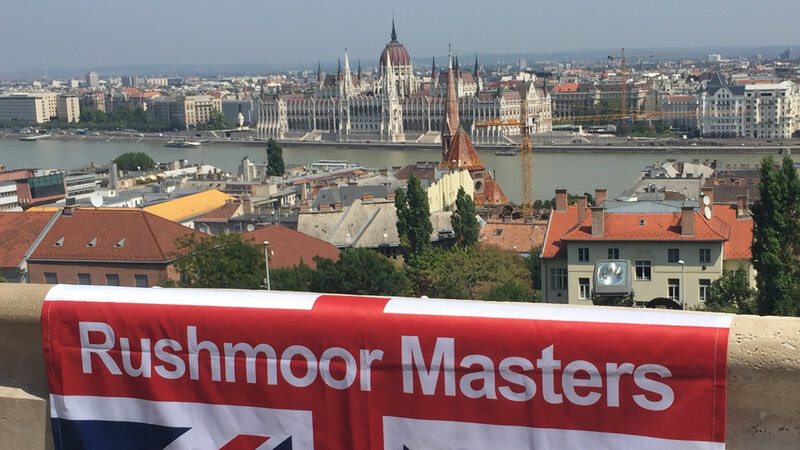 I recently went to the Masters World Championships in Budapest with nine of my club mates, both competing and acting as team manager for our team. The competition wasn’t without its hiccups, however we did exceedingly well and returned home with a total of 22 medals. The Technical solos began on a very cold and wet Monday. Carolyn Macdonald and Andrea Holland competed in the 50-59 age group. Rachel Davies and Carla Sanders competed in the 40-49 age group. Next up were Rachel and Carla, competing against 27 other soloists. Carla managed to secure 15th place with a score of 64.6250 (even after her hat fell off as she dived in) and Rachel secured 16th place with a score of 64.000. The next day was much brighter for the technical duets. Carolyn and Andrea were competing again, but this time together in the 50-59 age group. Rachel joined forces with Grace Reukers to compete in the 40-49 age group. Carolyn and Andrea were up against 16 other duets but managed to secure third place with a score of 65.1250, just 0.25 behind second. Rachel and Grace were up against 15 other duets and managed to secure fourth place with a score of 64.1250, just half a point behind the USA pair in third. Wednesday was the Technical team day and for some, the first day of swimming. The team were swimming in the 35-49 age group against 16 other teams. Expectations were mixed, as a group they had never swum at such a big competition before and were unsure of what level of swimming to expect. The swim went very well and the team managed to place fifth with a score of 63.2500, only 0.25 behind fourth and 0.5 behind third. Thursday went back to the soloists, this time for the free competition. Andrea managed to get eighth place for her free routine with a score of 64.7625. This meant she moved up the rankings and placed 10th overall with a score of 129.0125. Carolyn placed 14th after her free routine with a score of 61.5125, meaning she stayed at 15th with a combined score of 125.2625. Carla moved up two places for her free routine and placed 13th with a score of 65.0375, however her score was not strong enough to move her up the rankings and she remained in 15th place overall with a combined score of 129.6625. Rachel also moved up a place for her free routine coming 15th with a score of 64.6250, but again the score fell slightly short meaning she stayed at 16th overall with a combined score of 128.6250. All soloists swam extremely well and were all very pleased with how their swims went. Friday was back to duets. Carolyn and Andrea managed to move up the rankings after their free routine to come second with a score of 63.9250. It was not enough to keep them there, but they finished third overall with a combined score of 129.0875, giving Rushmoor their first medals of the competition. Rachel and Grace faced a slight problem at the start when Grace’s nose clip fell off after her dive. However, this did not deter the pair and they came fourth again after their free routine. They scored 59.700. Their main competition were placed eighth, meaning the ladies managed to jump into third overall with a combined score of 123.8250. This bagged Rushmoor a second lot of bronze medals. As you can imagine both pairs were extremely delighted with this result, as were all team mates and spectators. Saturday was the return of the team event. It was clear from the swim that the team were a little run down and tired as it wasn’t up to their normal standards. They placed sixth after their free swim with a score of 61.6000. They managed to remain in fifth place overall with a combined score of 124.8250. The whole team were thrilled that they managed to maintain their position. They couldn’t wait to collect their medals (fourth, fifth and sixth were all given commemorative medals to take home). Sunday was the combination team event and the ladies were swimming in the 40-64 age group. After some disappointment over their swim on Saturday, there were a few deflated swimmers. However, this was the favourite routine for most so spirits soon lifted in training that morning. The swim went very well and the ladies managed to secure fifth place yet again, scoring 60.6875. This meant yet another medal for them all. Sunday night was a night of reflection and celebration. The whole team, including supporters, went out for a well-deserved meal and glass of wine! Overall the venue was breath taking and the support was great. Everyone, be it swimmers, judges, organisers, volunteers, always had a smile and the feel around the pool was that of positivity. We all came home with some amazing memories and the medals were the icing on the cake. Click here to view full results from the FINA World Masters Championships Synchronised Swimming events.